I have been on a hunt lately. It’s a hunt I plan to be on the rest of my life. This hunt is not easy, sometimes it’s downright hard, but I know it’s totally worth it. I am on a hunt for Moments That Matter. What is a Moment that Matters? It is something that happens with your spouse, your child, a friend, or a loved one. A moment that you want to memorize and hold on to. These moments have been happening for awhile now, but until the past couple months I haven’t slowed down enough to see them. I mean REALLY see the moments. My journey began in May of this year when I started reading a book called Hands Free Mama by Rachel Macy Stafford. It has changed my life and the life of my family. After reading half the book, I started to implement what I learned right away. I realized several things while reading this book. One was that I was entirely too distracted by my phone. Email, text, and Facebook took a lot of my time. Secondly, I was distracted from being a wife and Mom because I spent so much of my time on the phone. When the kids interrupted me, I felt very annoyed. God got a hold of my heart as I read this book and reminded me of what I was home full time for. He also helped me to see how I was letting my to do list define my day instead of the Moments that Matter. At first, I was very determined and did really well with being on my phone at certain times. After a month or two, I could tell a shift in my attitude and my kids. After taking a hard look at how I was using my time, I realized I was on my phone at times where I needed to focus on my kids. It was time to implement once again what I had learned. I actually finished the book and reviewed all I had learned. It was so helpful and I got back on track. Once again, I started the hunt for the Moments that Matter. There are two stories that have happened recently that I am so thankful I didn’t miss. One Wednesday morning, I had a chiropractic appointment. While waiting to be called back, I try to play with the kids and just be with them. Well that day we had a friend along and they were playing really well. 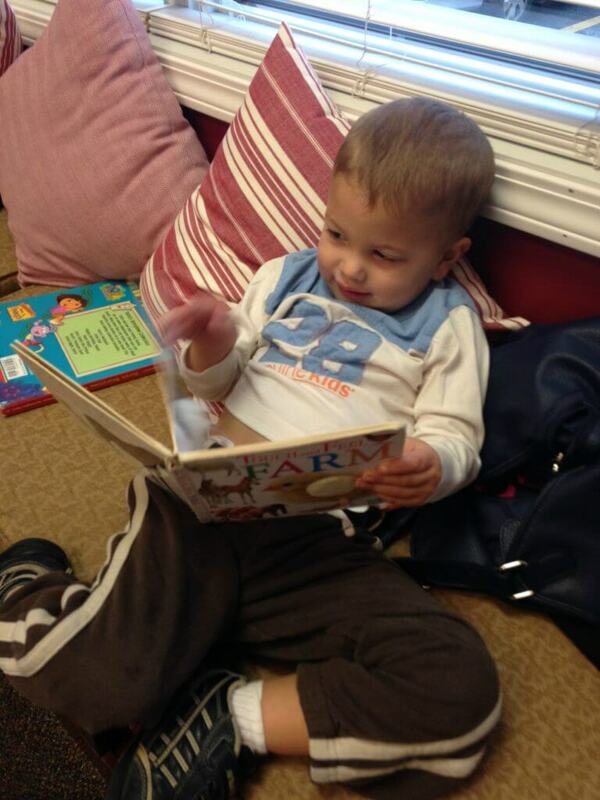 My son Caleb was lounging and reading. So, I pulled out my phone to catch up on texts. I mean, why not, right? Any Mom understands the need to take a breather especially when all is quiet. Soon after pulling out my phone, Caleb tried to climb up in my lap with a book. At that moment I had a choice. Put down my phone and read to Caleb or I could try to get him to entertain himself once again. I’ll be totally honest, I hesitated. But, then I put my phone down and pulled him into my lap. What ended up happening next was precious. Caleb, who is 2 years old, started pointing at all the different pictures in the book and reciting the names- apples, bunny, train, balloons, etc. He exploded with a vocabulary that I hadn’t heard from him before. Caleb “read” the book to me many times before I was called back for my appointment. It was a Moment that Mattered. I’m so glad I didn’t miss it. A few days later I was able to have another Moment that Mattered. My kids walk down about a block and a half to get to the bus stop. It’s a little hard to see them as they walk, but my goal is to be present by standing there and watching them until the bus is gone. I love to communicate to them they are worth my time. This is one of those times where it is very easy for me to glance at my phone. To check email, text or that Facebook notification that came across. That morning I thought to myself “It’s so far down to the stop that my kids can’t see me anyway, so I might as well check my phone.” But, I remembered my journey and stopped myself from pulling it out. And at that moment, as I looked down at the bus stop, Micaela, my daughter lifted her neon yellow-gloved hand and waved big. This Mom saw that hand and waved big right back. To think, I could have missed that precious moment. That was a moment that mattered. As I stated earlier, this journey isn’t easy, sometimes it’s downright hard. I have to break the patterns of being on my phone too much that have been there for a while. It’s easy to fall back into those patterns. But, I won’t stop this journey. I’ll keep looking for those Moments that Matter. Will you join me in the hunt for moments that matter?